Despite the fact that most travelers might already be aware or would have guessed that Laos culture is different from Western and other Asian cultures, some visitors to Laos are often frustrated and surprised by the extent of the differences. I hope the information on this page is useful and can (to some extent) help you prepare yourself for your cultural adventure. I believe that the more you learn and become aware of the Laos culture and the differences the better you will be able to cope as you travel or live in Laos. Laos has at least 49 ethnic groups and each of them preserves their own dialect, customs, culture and tradition. However, because over half the population are ethnic Lao (previously called Lao Loum) this is obviously the most dominant group in Laos and the one that most people encounter as the Laos culture. The rich culture of Laos is rooted in immense spirituality, as the predominant religion of Theravada Buddhism has influences extending from lifestyle to art and architecture. This is encountered in ceremonies like the Baci or Sou Khuan (a ceremony to enrich the spirit) and the common practice of alms giving every morning at sunrise. Most villages have at least one temple. These temples are not only places for monks to live and pray, they are also the main centre for social and recreational activities such as village meetings, religious ceremonies and festivals. In urban areas, temples sometimes serve as shelters for homeless and disadvantaged people. Sometimes when someone dies in an accident or outside their houses the body will be taken to the temple and kept there for a few days for religious ceremonies before it is cremated. Lao people typically socialise as families, and most live in extended families with three or sometimes more generations sharing one house or compound. The family cooks and eats together sitting on the floor with sticky rice and dishes shared by all. Sometimes when someone pays a visit unexpectedly at meal time we automatically invite them to join us without any hesitation. With the Lao people’s simple life, it is perfectly normal for relatives or friends to drop by without calling in advance. So, if you live or work in Laos, don’t be surprised if your Lao friends show up at your front door without letting you know in advance. If they do that, it’s not because they are tactless, it’s because it seems perfectly usual behavior for them, and also perhaps because they don’t know or understand your cultural habits. Time is also a fairly flexible commodity in Laos culture. Planning ahead and making firm times for occasions can sometimes be frustrating for foreigners who find the idea of something happening at “maybe two o’clock” difficult to cope with. Also invitations to parties and weddings are often only issued the day before the event and the host is sometimes surprised that others need more notice that this in their social lives. The fact that most Lao people were brought up in extended families that required a high level of harmony, kindness, patience and readiness to help each other has made the Lao a generous, kind and soft hearted, tolerant and socialized people. Lao people tend to value privacy less highly than foreigners, partly because it’s a normal way of life in extended families, especially in the countryside where everyone knows everyone else’s business. Sometimes for those foreigners living here this can be a surprise, especially with what they might find are slightly personal questions and the fact everyone in their village knows all about their lives. 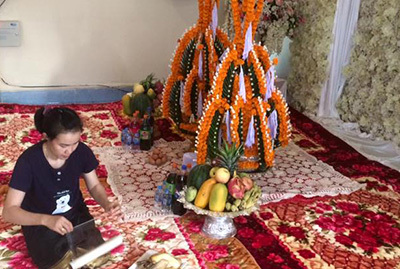 In Laos culture, before a Lao wedding takes place, (after the proposal) a traditional procession call Sou Khor is arranged (an envoy of the boy sent to the girl to ask if her parents will allow the marriage). 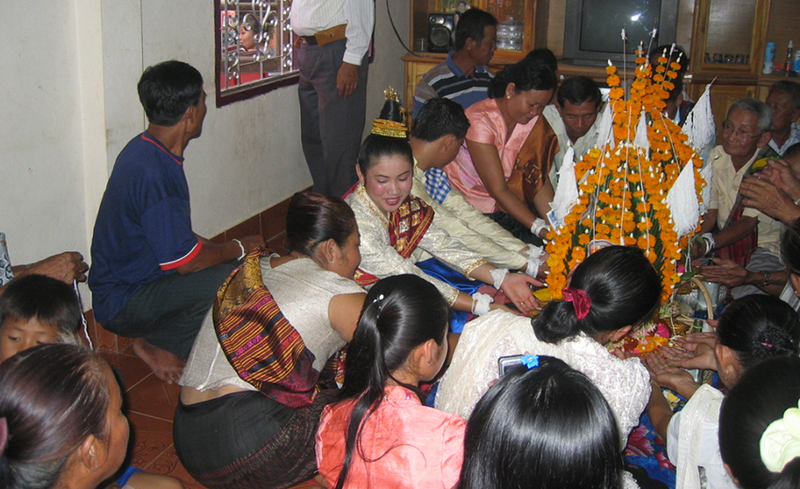 If her parents agree to let their daughter to marry the boy, a Kha Dong (bride-price) is negotiated as well as who pays for what at the wedding. This is usually the groom, but today often both parties share the expenses. 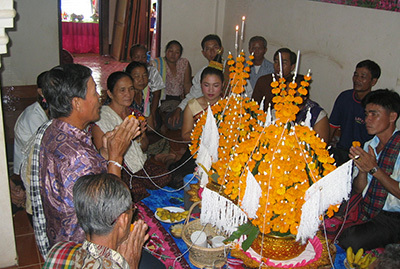 The Sou Khor session takes place several days or even months before the wedding. Visit Laos Wedding page for more info. Once married, the couple lives with the parents of the bride until after the marriage of the next daughter (if any) or in some cases they move out earlier but the earliest is seven days after their wedding. When the couple has children, the stay-at-home parents or grandparents usually help raise their grandchildren before they reach school age. Grown-up children usually also live in until they get married and sometimes even until after they have their own children so that the grandparents can help raise them or sometimes until they save enough money to build their own house. However, one of the children (usually the youngest daughter in big families) lives with the parents, inherits the main house, and takes the responsibility of taking care of aging parents. The moved-out children support their parents by sending money back if they live far away, otherwise they come to visit and eat together as a family very often. 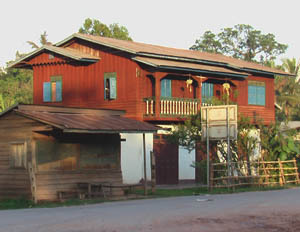 In Laos there is no social security or other welfare, such as homes for the elderly provided by the government. However, as our family bonds are strong and everyone in the family helps everyone out it is an important part of our culture to take care of our aging parents and grandparents. This might change in the future because the Lao simple life is slowly being replaced by modern lifestyles and the extended families are gradually being replaced by nuclear ones as people have fewer children these days.